“Keeping it real” on the Holyland Challenge, Israel, April 2015. The HLC 2015 was Lael’s first bikepacking race and only her fourth bike race, after the Fireweed 400 road race across Alaska, a local hill climb up Hatcher’s Pass, and a fifty mile fatbike race in Anchorage called the Frosty Bottom. The Tour Divide is her fifth. In the entire distance and duration of the Tour Divide, Lael never showered, never slept indoors, and only sat down to one meal, in Pie Town. Even at the Brush Mountain Lodge where she got wrapped up in an almost hour long conversation with the hospitable staff, she asked to take her blueberry pancakes to go. “Are you in a hurry”, asked the woman. When we arrived in Israel from Sinai this spring, our plan was to follow the HLC track across the country, from south to north, then exit Israel by plane. Instead, we spent three months in Israel, riding circuits along the HLC track, in the Judaean Desert, in the Negev Desert, in the Golan Heights, in the suburban center, and in neighboring Jordan. We stayed long enough so that Lael could participate in the HLC, an event which is the cultural core of the Israeli bikepacking community, much inspired by the Tour Divide. Israelis were astounded at her performance in the event without clipless pedals, without padded shorts or cycling gloves, without a sleeping pad, and without much more than a pack full of sandwiches and a sleeping bag. The cotton t-shirt was also an anomaly in a culture obsessed with cycling kit and equipment. 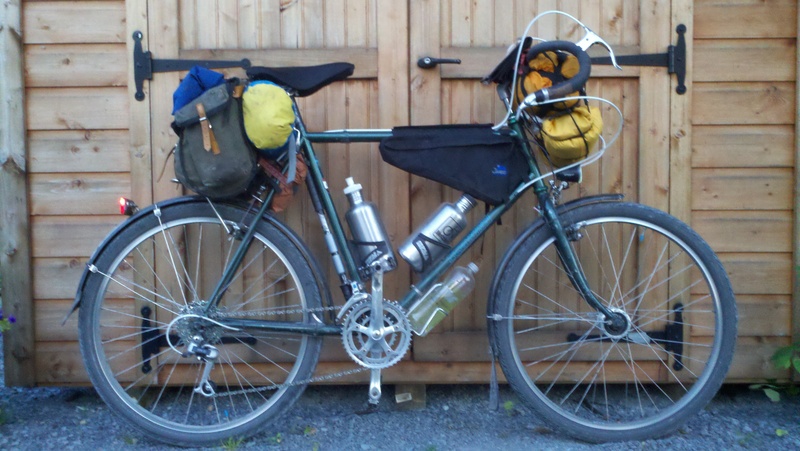 Her rusting steel frame and worn 8-speed drivetrain were incomprehensible to many. But that is what she had, that is what she had ridden for the last nine months through more than a dozen countries. In the week before the HLC we selected this novelty t-shirt from a suburban shopping center along the HLC track near Tiberias. This would be her race jersey for the HLC. During the Tour Divide, Lael would call every day or two, usually while riding out of town. She was concerned about wasting time. In retrospect, I realized that she was so focused on the race she simply didn’t have the urge to report much to me. The ratio of how much I cared and worried about her to how much she wanted to call me was greatly imbalanced. I won’t hold it against her. We spend a lot of time together. Now that the race is done I’ve begun asking questions, and the answers I receive are incredible. We’ve toured together for over seven years. It thought I knew all of her secrets. But her secret solo dirtbag lifestyle is all her own. In Sparwood on the first day, Lael ordered three foot long subs. She asked the Sandwich Artist to slice each footlong into four sections, and place each in a separate plastic bag. That way she could eat on the bike. She ate all of her meals on the bike in a similar fashion, a skill she developed on the Fireweed 400 last summer. After falling ill on the first night, walking up Galton Pass, and barely arriving in Eureka, she disposed of two footlong subs which she was unable to eat due to her condition. She wouldn’t consider another Subway sandwich along the route until Del Norte, where she packed a few sandwiches from the gas station for the ride up Indiana Pass to Platoro and Horca. She told me she hates the bread at Subway, “the bread is half baked”. Asked which foods she preferred from the stops along the route, she clarified that she prioritized quick stops to ideal nutrition. The hot case in gas stations provided satisfying calories. She discovered that Fritos and cheese– packaged gas station cheddar and colby, or sliced orange American cheese, or even local cheese curds in Lima– packed well into her Revelate Gas Tank for easy access while riding. Now that’s a gas tank! She purchased Clif bars to augment the real food, which are now commonly available in American convenience stores. I’m sure there are a long list of food stories which will come out in time. I’d be surprised if she can remember half of what she ate. She didn’t eat any candy. None. No gummy bears, peach rings, Mike and Ikes, Snickers, M&Ms. Near the end of the race, she started drinking some soda. Dry heat has a way of making you crave carbonation, sugar, and cold drinks. She mentioned that these drinks are packed with calories, which she’d be shoveling into her mouth one way or another. She always drinks as much water as possible when it is available, and packs as little as needed along the route. She relied upon tap water along the way, and frequently augmented that with untreated surface water when available to reduce the loaded weight of the bike, often using only a single water bottle. Her maximum capacity was about 4L, which she only used once when leaving Atlantic City at night. She used the bladder one other time when leaving Wamsutter, where she filled both water bottles and put an extra liter in the bladder. Riding towards the Colorado border, she ran out of water and went searching on a remote oil drill site, wandering into an office on a Sunday when no one was around. She found two half-liter water bottles, each with a few sips left. On the rest of the route water was not a challenge. She drank coffee infrequently, only when it was convenient. Several times she pedaled out of town with a cup of coffee in her hand. She admits to consuming a 5 Hour Energy about once a day. She would pack it away for the morning. Rise, ride for a while, awake to the day naturally, then take it like a shot in the arm mid-morning and ride all day. Her sleeping system consisted of a Western Mountaineering Summerlite sleeping bag and a Western Mountaineering HotSac, a VBL which doubles in this situation as an emergency bivy. This is equipment which she has been using for years. The sleeping bag has a busted zipper and the fabric is ragged and fragile. It has been repaired by hand in many places. On at least one night, she slept in her helmet, which she discovered was a comfortable solution to supporting her head and staying off the ground. She did not pack a sleeping pad. The ride from Grants to Silver City is the longest section of the route without services– about 240 miles– except for the two pie shops in Pie Town. A store is several miles off route on the rural state highway, so not a worthwhile option to TD racers. Lael packed food for the ride to Silver City in Grants, expecting to miss business hours at the Pie-o-neer Cafe. As she rolled out of Pie Town Kathy yelled at her through the window to come back. She toured the kitchen and sat for two slices of pie and some leftover chicken pizza. Kathy’s husband Stanley reheated some coffee. Kathy packed several peanut butter and jelly sandwiches and a banana for the road. Lael enjoyed a slice of peach pie and a slice of apple crumble. Lael signed the TD pie registry, which will be billed to Salsa Cycles who sponsored each rider with two slices of pie, and noted Josh Kato’s name. I’d told her from Grants that he had won the race. Lael told Kathy. She was excited, and recounted how nice he was. Neil and Jay didn’t stop for pie, so Josh was the first rider to present his custom Salsa Cycles top cap for two free slices. Inside the cafe, Kathy asked to see the top cap. Josh went outside and removed it from his bicycle to prove to her that he was indeed a valid TD racer with the metal (and mettle) to prove it. Later that day, as photos of Josh and his top cap cycled through social media, a representative from Salsa Cycles called the Pie-o-neer Cafe to let them know that the racers don’t actually have to remove the top cap from the bike. Exiting the Gila section of the route, turning onto the CDT, Lael ate her last handful of nuts from Grants and took her last sip of water. She would refill water near the end of the CDT section from a stream. She stopped at the McDonalds in Silver City at about 11:30PM with 128 miles left to the border. She packed 20 chicken nuggets, large fries, 8 cookies, a McDouble, and a french vanilla latte. She stopped at the gas station for a 5 Hour Energy and a few bars. Aside from this short stop in Silver City, she moved almost continuously from the road crossing at Highway 12 south of Pie Town, all the way to the border. That’s 275 miles. At a gas station in Montana, a woman commented that Lael had “that windblown look”, referring to her hair. Thereafter, she kept her helmet on at all times. Thirteen miles from the finish, a cat crossed the road. “It strutted”, with wide shoulders and pointy ears. Just when she thought this was a lackluster section of the route to an anticlimactic finish, she realized it was one of the most remote parts of the route, despite being on pavement. She saw one bear from Banff to Antelope Wells. Lael Wilcox congratulates Joe Fox at the finish in Antelope Wells, NM, the least used border crossing between the USA and Mexico. Photos courtesy Monica Garcia. Top photo Nicholas Carman. A night on the HLC and IBT routes, which for a time follow adjacent tracks along the Jordanian-Israeli border in the Aravah Valley. No plan for camp and too much time spent inspecting sandy dates and pomelos on the ground, night falls too soon. The desert expanse is without features for miles, and a north wind blows. A bus resides between and beneath two communication towers, within sight of a disused observation structure on the Jordanian side. Russian and Hebrew graffiti color the outside of the bus. Passing from Egypt to Israel, we are no longer wealthy tourists but experienced opportunistic dirtbags. I swear, we haven’t changed. No culture shock, except two-thirds of every road sign is illegible, and one-third is in English. And, for the first day we don’t know the exchange rate from shekels to dollars, so Monopoly rules apply (try not to spend, but it is not real money so who cares). The other two languages are Hebrew and Arabic, with Hebrew on top. Leaving Egypt, border agents rigorously inspect a few chosen items, ignoring most of the rest. They seem most curious to fondle the sack of flatbread in my framebag, ignoring the conspicuous 2L steel bottle on the underside of my down tube. Israeli border agents are far more professional, interviewing each of us separately to determine how we manage to travel with so little luggage, for so long. “Don’t you stop to see the sights?” Lael informs her that we are always seeing sights, all the time. Our bikes are loaded onto the conveyor and sent through the x-ray machine. Public bathrooms with sit-down toilets and paper and hot water, and they don’t cost two rand. Free sugar packets from every roadhouse. But cane juice is gone and the bread isn’t as good as Egypt, and everything seems really expensive except it’s really just like America. Local kibbutz communities do produce organic dates, olives, goat yogurt, and wines; although expensive, they are worth the money. The biggest homecoming to the first world? Some schmuck who asks too many questions he already knows the answer to, while I am eating. Don’t interrupt my meal to be a schmuck. I’m far too familiar with this practice. Americans do it well. We connect signed dirt trails straight out of Eilat, linking to the Holyland MTB Challenge race route and the Israel Bicycle Trail the next morning. The Holyland MTB Challenge took place for the first time last April, connecting the southern border at the Red Sea to the Golan Heights in the north, near Syria. The Israel Bike Trail will also connect the country north to south, and is currently complete from Eilat to Mitzpe Ramon, included miles and miles of freshly signed and graded singletrack through the mountainous desert. Thus far, in two days of riding, the two routes coincide for much of their distance. Thus far, the riding and camping is Israel is great. Leaving Eilat and the Red Sea. Hiking and cycling trails, signage not seen since Europe. Designated camping areas minimize impact on the land. Often provided for free, they do not have water, but offer space and fire pits. So far, I’ve seen only drive-in sites on dirt roads. Technical riding on rocky sandy footpaths, trying to find our own way through the mountains. Easy cycling routes, mostly on dirt roads. Camels on wheels are cool. The colors of the Israel National Hiking Trail. Which provides a shortcut up a mountain. We choose to hike our bikes to avoid a $12 per person park fee, required by way of the main dirt road and the HLC/IBT route. Which opens up to a rideable plateau up top and a playground of trails. Eventually connecting to the IBT and the HLC route. Israel Defense Forces (IDF) property and nature reserves cover much of Israel, I’ve been told. Incidentally, IBT signage only routes from north to south– no signs coming from the south. Hopefully the northbound signage is forthcoming. And an unofficial wild camp on an east facing ridge. A campground listed on my GPS turned out to be a commercial quarry. Instead, we take the opportunity to camp up high, overlooking the Aravah Valley and Jordan. Haven’t found alcohol for our stove yet, so a fresh cup of singletrack will have to do. The imprint of the trail-building machines can still be seen. Jordan in the distance. Switchbacks and countours– modern trailbuilding, durable trail. Old trail, and new bike-specific trail, both apparently in use. Some sand, not too much, but just enough soft stuff to think that now would be a good time for 29+. Are those Surly Dirt Wizards available yet? Fresh goat yogurt at our only resupply point for the day, the cafe at kibbutz Neot Semadar. Arroyos, called wadi, which is Arabic for valley, usually a dry desert valley. We plan to ride a few more days of the HLC/IBT before turning west to meet a group of riders over the weekend, which will lead us back south toward Eilat. Thereafter, we shoot north to meet our friend Christina in Tel Aviv, who is flying from Alaska for ten days of sun and sand in the desert. Cool nights, warm days; dry, not too hot, fresh trail– nothing not to like. This route is a composite from the Dragon Trax website and our own adventure compass, connecting the border of Lesotho at Monantsa Pass through Swaziland at Bulembu, passing through part of KwaZulu-Natal and Mpumalanga Provinces in South Africa. The riding mainly consists of wide open gravel roads, railroad service roads, and forest roads, as well as some tar. Only a week ago, I was happy to be leaving South Africa for Lesotho. But we’re pleased to be back. We look forward to a proper shower, an internet connection, and vetkoeks. The thing we crave most is the mental space to relax. I’ve never considered myself an especially private person– and I’m not in my own culture, I don’t think– but Lesotho has shown me how much personal privacy we have built into our lives. In time, South Africa is less and less challenging. And while we are still learning and questioning and understanding, we begin an unconscious process of acceptance. We know what we will find in local shops and what we like to eat. We know how and where to find places to camp or who to ask. We know which tar roads might have wide shoulders, which will have little traffic, and that the endless gravel roads are our home. That word– “home”– is something which comes up infrequently while on the road. It is only through the impassioned love of a place, such as in Albania, or with time that we might think of a place as home. Here, it is time which has worked to make us feel this way. That, and the shared cultural elements which make South Africa so much like America. I have to laugh when South Africans ask knowingly about America, to point at the faults which Hollywood and media have so effectively spread to their shores. Yes, we eat a lot of junk food and drive big cars and get fat. It’s true. “But so do South Africans”, I say. “Is it?”, which is the universal response for anything agreeable or disagreeable in South Africa. Lean you head to the side, and ask calmly, “is it?” It means as much or as little as “really”, which is as much a habit in America as “is it” is in South Africa. But to me, the accent which Afrikaners impart on English is beautiful and charming. Is it? We define newly discovered cultural similarities daily. Coming from Lesotho, we shoot north to Kestell to camp for a night at the Karma Backpackers. Vintage South Africana is everywhere in these old towns, which reminds me of the American West and the history of westward migration. Voortrekkers left the Cape Colony to settle vast tracts of land in the interior, c. 1830-1840. Many people traveled overland by covered wagon into sometimes challenging climates, to face attacks by the displaced or defensive native people, to eventually establish farms and communities such as the capitol city Pretoria, named for Andries Pretorius. Vetkoek, literally meaning fat cake, is common in small town shops. The fried dough is like an unsweetened donut, and at 1 rand apiece, makes an affordable packable snack. Lael puts salt on everything. The Nederduitse Gereformeerde Kerk, or the Dutch Reformed Church, is a feature in many South African towns, although Anglican churches are also common. Toyota trucks are a favorite of South African farmers. Ford has recently entered the market. Other Asian brands such as Mahindra, Isuzu, and Nissan are present to a lesser degree, as a lower priced alternate to the revered Toyota. The greeting of wide open roads and rolling topography is refreshing after our time in Lesotho. Each time we leave a country and return, it feels more and more like home. This is a continuation of the Drakensberg, which are featured more prominently to the north and the south. This is the kind of riding, much like the karoo, that makes the Dragon’s Spine route like the Great Divide. Dropping off the edge of the Escarpment, from 5000ft+down to about 2000ft. Trees, heat, and humidity are more abundant down low. The Dragon’s Spine route takes us along the railroad tracks from Elandslaagte to Wasbank, a once-great town that is now an impoverished shadow of its past. Trees are growing through the windows of the old train station. A hotel is advertised, now home to a single pool table and a bottle shop. Some old towns are charming, but not Wasbank. We are grateful to meet a shop owner who calls his parents, who offer us a place to put our tent for the night. Inevitably, they invite us inside, feed us a traditional Indian meal, and offer showers and a bed. Their family has owned the petrol station in town for many years. This is not the first time we’ve ridden RR lines in South Africa, but it cements the concept. Most RR service roads are ungated and seem to be pretty reliable routes to travel by bike, although interruptions in continuity are possible, which add to the adventure. Dundee, where we are interviewed by the local newspaper, the Northern KwaZulu-Natal Courier. We speak with two very nice young woman, a reporter and a photographer, and the next week they publish an article titled “Living young, wild and free from Alaska”. Everyone describes the failing school systems in South Africa. Most people have to pay to go to school, and options for high-priced education is available to those that can afford it. The poorest children can attend school for free, and there are food programs as well. I’m not certain of the quality of a free education in South Africa. I’ve met some promising youth, but a lot of young people are slipping through the cracks. RR lines are awesome in South Africa! Johann, our host from Prince Albert, described a trip he made many years ago following RR lines for a great distance across the country. We’ve only seen freight lines thus far. Railroads, like canals, show you life away from tar roads. We meet a farming family for the night. We tour the farm and the irrigation system, which provides just enough water to grow maize in this semi-arid climate. They prepare a braai. Near Utrecht, the only town in South Africa within a game reserve. Riding the RR line toward Piet Retief, and Swaziland. The quantity of productive timberlands increase around us, all the way across the border. We immediately notice the nice roadside bus stops. The absence of now-familiar South African economic inequality is obvious. That is, people are more uniformly poor in Swaziland, which to us, makes the county feel wealthier. There is a calm to the country. There are few fences. People smile. People speak English really well, and have ideas and opinions. These are our first impressions. That’s how you source local food. As in Lesotho, Swaziland is also the beneficiary of foreign aid. New schools are a common project, as are improved toilets and rainwater catchment systems for the schools. The timber industry is healthy in the mountainous west of Swaziland. In the eastern lowlands, sugar cane and bananas are the main production crops. Agriculture and other industries are partly organized through the monarchy. Pines produce pulp and other low grade products such as fencing and palettes. The Coca Cola Company dominates the market in South Africa. This cold grape-flavored Fanta is 40 rand, or about $0.35. The currency in Swaziland is also fixed against the South African rand, as in Lesotho. Beer and soda sold in both Lesotho and Swaziland is made in country, licensed from the South African parent company. No need for coins, I watch these kids play round after round of ‘The King of Fighters” by coaxing the tines of a plastic fork into the coin slot. This is outside a rural shop. Shoot me! The kids are relaxed and kind, a little less maniacal than in Lesotho. I really enjoyed this group. While taking a series of obligatory portraits, I try to organize a group photo before leaving. They stop me as I begin packing up, “you must shoot him”. They are referring to this young boy, who has been slowly making his way from down the road ever since I arrived. All the other children quickly arrived at the road. It just took him a little longer. Mostly, the children don’t treat him any differently. Summer nights are nice, as long as the heat sets with the sun. Tracing the western border of Swaziland on our brief tour of the diminutive kingdom, we camp near Ngwenya for the night. Sunday night party outside the General Dealer and bottle shop. This bar is bumping tunes to a small crowd of men, children, and older woman. It is not uncommon to hear Paul Simon’s “Graceland” album in between classic African artists and more modern electro-pop. The song “Koze Kuse” by DJ Merlon featuring Mondli Ngcobo is the most popular song in South Africa right now, if the stereos of local taxis are any indication. The music video captures some classic South African scenes. Steps Over Swaziland, a film project advertised on the side of the road by this LP-sized sign. Swaziland claims the highest incidence of HIV/AIDS in the world. Public service announcements, free public health services, and free condoms are common. Diving back into the Timberlands on a series of tracks in the area near Pigg’s Peak. This northwestern part of the country is prime for explorations, folded with mountains and laced with logging roads. There are several MTB races in the area, mostly attracting South African riders. This route connects us back to the border of South Africa at Bulembu, now famous as the home of the Bulembu Emasi dairy. Called mass, amasi or emasi, this cultured milk has a bright fresh yogurt taste, much like the yogurts we enjoy in Eastern Europe. It is the best energy food in South Africa (sorry Coca Cola and Nik Naks). Bulembu is an old mining town revitalized by the dairy and a small stream of tourism. Asbestos was once shuttled to Barberton, South Africa by an aerial cableway (like an alpine gondola), a distance of over 20km through very mountainous terrain. Back in South Africa. While the roads turns to tar across the border, the ride from Bulembu to Barberton is epic. The road rides high ridgelines until a blazing fast descent drops us into Barberton, 3000ft below. The road is punctuated by geology lessons, funded by the state. Called the Geotrail Route, the new roadside facilities don’t seem to get much use. The road is deserted. This academic paper provides a fascinating overview of the mining history in this region, with maps and images. This is one of the most significant gold mining regions in South Africa. Descending to Barberton, we once again meet hot and humid weather, as well as mangoes and bananas. We’re about a week away from the border of Zimbabwe, and the end of our ride across South Africa. 1:46 PM, Railrunner train in Albuquerque. 2:45, Kewa/Santo Domingo station. 3:15, Peña Blanca; 3:45 Cochiti Pueblo and grocery. 4:15, FR 289 or St. Peter’s Dome Road, gated dirt. Rain. 5:30, dark. Climb. 6:15, camp. Wind and rain and wet clothes. 7:30 AM, awake. Cochiti Canyon. In a search of exceptional bike rides in this country, several results turn up. The Great Divide Mountain Bike Route is the longest dirt route anywhere; the GAP/C&O trail and the KATY trail are some of the longest rail-trails around and offer pure traffic-free riding. The paved TransAmerica Trail (TransAm) is historic, winding along America’s backroads, while the Pacific Coast route is ever popular. Every state has it’s hallmark routes, and the western states feature an incredible network of public roads on USFS and BLM lands. Even, other National Park roads such as Shenandoah’s Skyline Drive and Glacier’s Going-to-the Sun Road are conversation pieces of places people like to ride. However, nothing compares to the 92-mile Denali Park Road. Climbing from the Nenana River at the park entrance, the road travels westward along the northern side of the Alaska Range over a series of low passes, crossing several major rivers to achieve banner views of Denali and the range. Riding high above the braided rivers– the Savage, Sanctuary, Teklanika, Toklat– several passes are carved from mountainsides to avoid the ever-changing floodplains below. The effect is otherworldly; at least, roads like this are known only from snapshots of Himalayan and Andean roads. In this part of Alaska spruce forests give way to sub-alpine shrubbery at about 2200 ft, and to a mossy alpine tundra further up. The main section of the road from the Savage River entrance at mile 14 to Wonder Lake at mile 85, is mostly above treeline except when at river level. Aside from the scenery and the wildlife, the lofty peaks and the wildflowers, it is the “atmos” of Denali that is the most engaging. Incoming air masses are regurgitated by the highest peaks. The result is a witches brew of weather, with blue skies and thunderclouds competing for space. The feeling is electric, and as Denali comes into view, shocking. Clear blue skies are not unknown here, but are uncommon for any length of time and many visitors to the park never actually glimpse the Denali, “The Great One”. The occasional views to the north or south of the range, toward Fairbanks and Anchorage, often show uniformly calm skies. But these are big mountains rising from a broad flat landscape– they make their own weather. I rode the full length of the road from the park entrance at Riley Creek to the gold-mining district of Kantishna at mile 92, and back. Wishing to spend less time riding, many visitors combine a green shuttle bus with some riding and camping. The green “camper buses” can drop off or pick up anywhere along the road, space permitting– simply wait for the next bus and flag it down. A BRC (bear resistant container) is provided for storage of all food and scented items to hikers and cyclists. I wasn’t sure how to pack it at first, but the Carradice Camper swallowed it up, thanks to the “longflap” feature. I’ve been abusing this bag for almost two years, and it’s due to receive a little TLC. Repairs are simple, and a durable needle and upholstery thread do more than solve the problem. When I’m through, the bag will be better than new. That’s the beauty of a durable canvas bag– it wears in. An plastic Ortlieb-style dry bag wears out. Above, the Park Road is shown by the dashed yellow line as it passes the Muldrow Glacier near the Eielson Visitor’s Center at mile 66. The Muldrow Glacier (the blue lights are at the foot) was the first route used by climbers to ascend Denali. The impetus for Mt. McKinley National Park (renamed Denali NP in 1980) was not only to encase North America’s highest peak, but to preserve the Dall sheep and their habitat that were in danger of decimation by market hunters. Charles Sheldon championed the Dall sheep as a unique species worth preserving, and assisted in the formation of a national park in 1917, several decades before statehood. These days most visitors come to see the brutish bears, but it is the Dall sheep that are the most regal and unique. From craggy perches they survey the land around them, enjoying the respite of the summer season. Their snow white coats are camouflage in winter but make them highly visible this time of year; thankfully, few of their predators can approach their rocky dwelling. Looking north, about 3:30 AM.